Highhill Homeschool: How does homeschool co-op work? How does homeschool co-op work? With an increasing number of families choosing to educate their children at home there are many different types of co-op's available. Co-op's are a form of team teaching each with their own structure and goals. When families get together, parents are often required to take on a portion of the teaching. Educating my own children since 2007 we have been involved in three different types of co-ops. The first year we home schooled we participated in a co-op in which each parent was required to offer at least one class or arrange one field trip during a three month period of time. A class was a one time commitment usually lasting between two to three hours on any topic chosen. Offering a class allowed the family to participate in as many or few classes and field trips offered by others. Some we attended were making African drums, fairy story and garden creation, and making and playing with slime. The second co-op we were involved in was when my oldest was six years old. She attended a Montessori school on Fridays. They did art, gym and music in the morning and special topics such as the Iditarod and Israel in the afternoon. The program was run by the school and parents did not participate at all. Currently we participate in a history co-op with three other families. We study one ancient civilization through a weekly activity. The kids do writing assignments associated with the lesson and present their work the following week. Each family is responsible for planning one-third of the lessons. I have learned many things participating in co-op. It's easy to sign-up for everything leaving little time left over for book learning at home. Now I make it a point to spend the morning hours at home doing school work. Spending time at co-op lessens the control parents have over the curriculum. If the subjects are interesting to the children, they are learning and the parents are happy with the topics it's probably a good fit. If the lessons are random and there are too many participants it may not be worth the time. Learning from others who are passionate about a subject can be very inspiring. Families are exposed to interesting topics and different teaching methods. Seeing the same families each week builds friendships and creates a sense of community. We are currently participating co-op, and have many times throughout our journey. To me, the advantages outweigh the disadvantages, and we plan to continue with co-op. 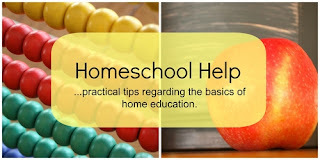 This post is part of the Homeschool Help Series in which several homeschooling bloggers share their experiences and opinions on various topics. Nicole at One Magnificent Obsession - How to evaluate if co-op is right for your family. Here are some of the earlier Homeschool Help Series posts. To see the rest of the posts and future topics please visit our Resources Page. April 9 - Parenting - How can I get some alone time? So true. We definitely need to weigh up the pro's and cons and make sure that we are moving forward and are not stagnant. PS your history co-op posts are great. Thank you for sharing them. interesting post :) thanks for sharing!! (I just left a comment but I think there was an error- apologies if I leave two.) It sounds like you've had some good co-op experiences - interesting to hear about. Your history co-op sounds like my kind, with a well-defined focus. It has been the best co-op by far. The kids were really too young when we participated in the first one and the classes were too random for me. The second one was like public school one day per week, so that was alright, but we stopped doing that one after the first year. The history co-op is great! It's focused, small and consistent, plus the kids are learning. Now that you know you prefer working with one or two other families it should be easier to find a co-op because you can just invite a few ladies to work with you and put it together. I hope your move goes smoothly.